It will probably come as no surprise for me to confess to owning a lot of baking tins. A selection of them are used on a regular basis – in particular the loaf tins. Others get an occasional airing whereas some have never been used. One of the tins that was falling into this later category was a jumbo muffin tin I bought in the Marks and Spencer sale some tin ago. I've always wanted to make the extra large muffins that you can buy in coffee shops and cafés. Once I had purchased the tin I then found I couldn't find the right size paper cases for the tin so it was left unused. When I went to the Denby factory after Christmas I eventually found just what I was looking for. So finally these are the first muffins baked in the tin. Just like a standard muffin mix you separately prepare the wet and dry ingredients. The fat used in muffins is usually in liquid form and in this case it is melted butter. This means you need to prepare the other ingredients first and then mix it all together quickly once you have melted the butter. If you don't the butter will start to reform. For the chocolate you can use chocolate chips or break up bars of chocolate. I prefer to break up bars of chocolate as it means you get chunks of different sizes and you can choose exactly what type of chocolate you want to use. For the orange flavour I use orange extract which you can find in the supermarket in the baking section next to the vanilla extract. 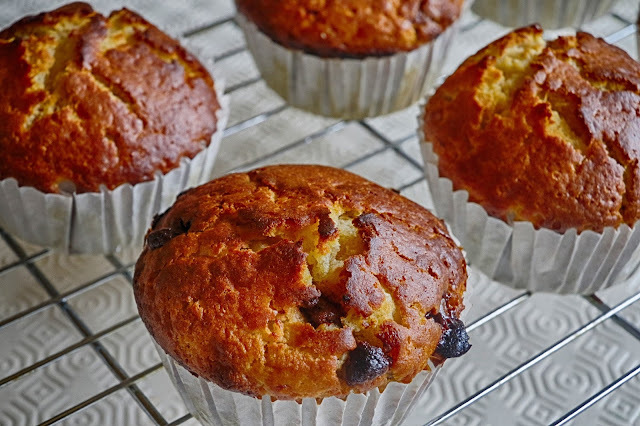 In fact if you don't want to have orange flavour muffins then use vanilla extract instead. 1. Pre-heat the oven to 200°C/Gas mark 5. Line the muffin tin with the paper cases. 2. In one mixing bowl put the dry ingredients of flour, sugar and chocolate and mix together. In the other bowl combine the wet ingredients of eggs, milk, orange extract and melted butter. 3. Add the wet ingredients to the dry and mix together quickly so all the ingredients are moist. The mixture should look lumpy. 4. Fill each of the paper cases. 5. Bake for around 25 minutes until the tops are golden and a skewer comes out clean. 6. Remove from the tin and let them cool on a wire rack.